The Affordable Care Act faces a critical repeal vote this Thursday. This is a do-or-die moment for the ACA. Exactly seven years to the day of the Affordable Care Act becoming law, the House of Representatives will be voting to repeal it and replace it with TrumpCare—a plan that would lead to 24 million Americans losing their health care. Republicans are rushing to get this bill through before the upcoming April recess, ignoring the normal legislative process, because they don’t want to face you, their constituents. They are attempting to ram through a TrumpCare bill that will cut coverage for millions and raise premiums for millions more. Their proposal simultaneously guts Medicaid and gives a $600 billion tax break to the wealthy and corporations. Millions of lives hang in the balance. The House vote this coming week is the first step towards enactment of this devastating TrumpCare bill. But you and your Indivisible group have the power to stop this. Saturday & Sunday: Activate your group. Do your research, gather your speakers and personal stories, and prepare with your group. 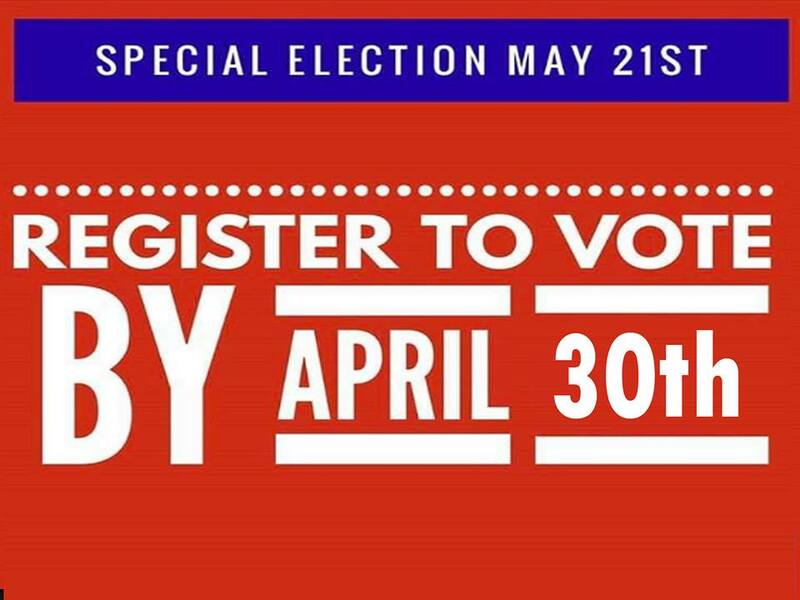 Make sure that every single person knows just how important this week is. Use our new “Save the ACA” resources to understand exactly what the impacts of TrumpCare will be on you and your neighbors. Host an emergency conference call or meeting and get ready. 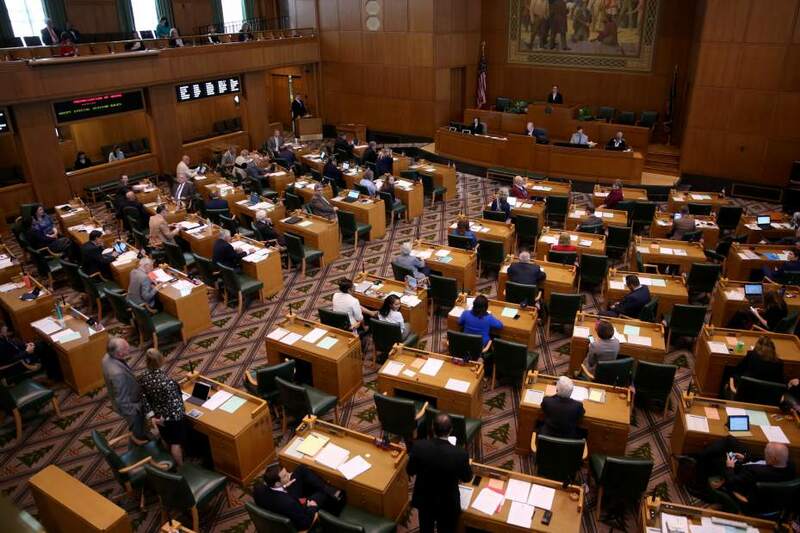 Check out how premiums will rise in your Congressional District by going here. Show up. Show up at your Member of Congress’ (MoCs) District Office with your group to demand that your MoC vote against TrumpCare. 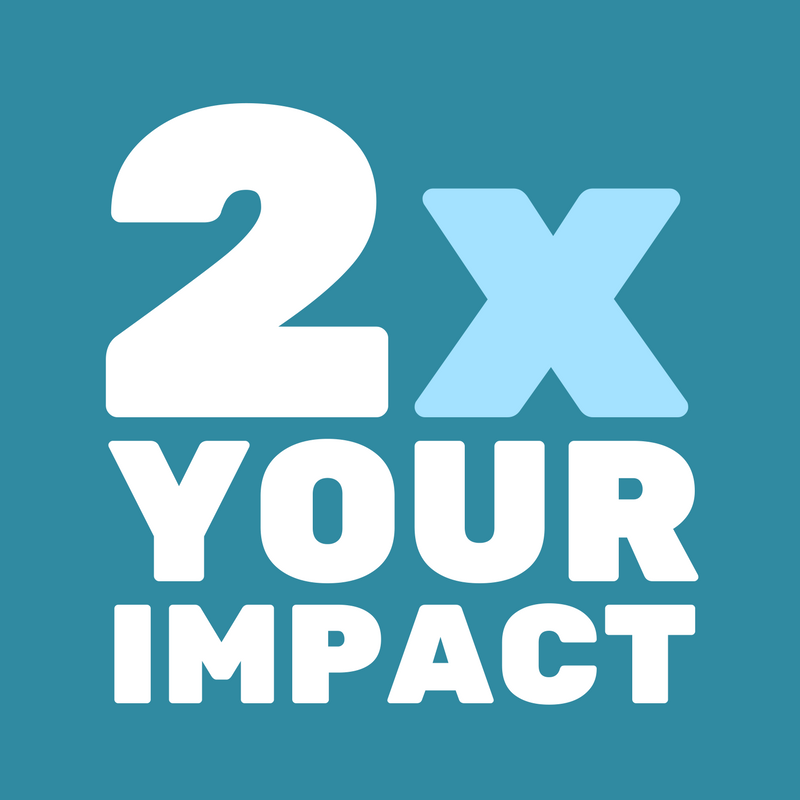 Bring affected individuals to these meetings and use personal stories as much as possible. Your stories are powerful—stories change minds and alter what is politically possible. Your story should answer this question: How will you or your family be affected by TrumpCare? Create a public demonstration. Hold a vigil outside your MoC’s office. Invite the media. Their vote in favor of this bill would mean the difference between life or death for thousands each year. You need to demonstrate your resolve. 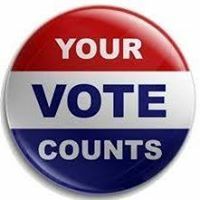 If your member has already committed to vote no, show up and thank them. In a big way. Make your calls to your Representative. Start with this script and tell your Representative that a vote to take away health care from 24 million people is a vote you'll be watching. Spread the word on social media using #RejectTrumpCare and tell your friends, neighbors, and colleagues to call their Representatives. Get creative. You’re leading this movement—it’s your constituent power, so use it how you see fit. We’ve seen some local Indivisible groups create scrapbooks of local constituents who would be affected by TrumpCare. Others have brought their children who stand to lose coverage to the MoC’s district office. Your goal is to make clear to your Senators and Representatives—and any local media who will listen—what TrumpCare means for you and your family, friends, and neighbors. Plan a Friday district office visit to hold your MoCs accountable. The House vote is expected Thursday. No matter how your MoC votes, you should provide IMMEDIATE feedback (positive or negative) by making a visit to their district office on Friday with your Indivisible group. Your MoCs will have to take more votes in the future on TrumpCare to pass the final bill. They’ll be holding their breath and watching carefully after this vote, hoping that the outrage dies down. By providing immediate feedback today, you’ll change their political calculus tomorrow. On Monday, March 20, Judge Neil Gorsuch will have his first hearing in the Senate Judiciary Committee as nominee to the United State Supreme Court. Gorsuch’s extreme record on everything from women’s rights to civil rights to corporate power is simply unacceptable. It’s vital that your Senators hear from you on filibustering his nomination. We’ve partnered with other activists as part of the People’s Defense so that we can all stand indivisible together against this dangerous addition to the Court—check out this campaign for more information and use our new #SupremelyExtreme resources page to tell your Senators to vote no. 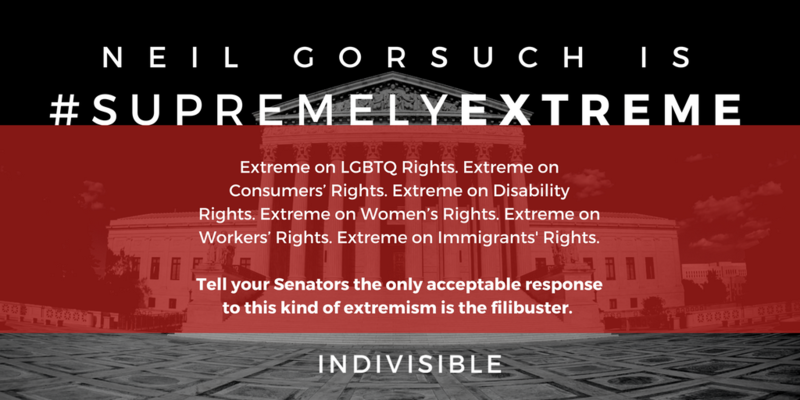 In short, Gorsuch is a #SupremelyExtreme pick from a President with no mandate whatsoever. Meetings are the lifeblood of an organization, whether it’s a meeting for five people or 200+. This week’s bite-sized resource document walks you through best practices to keep your meetings effective and efficient. Check out our tips for how to structure your meetings for success (spoiler: have a clear outcome) and keep it on track: How To Run an Indivisible Meeting. Plus: Have legal questions for your group? Remember that you’ve got access to Indivisible’s partnership with Lawyers for Good Government. You can sign up to get pro bono legal support for your Indivisible group. Learn more here. Republicans know that their bill stripping 24 million Americans of their health care isn’t going to get the 60 votes in the Senate needed to pass legislation. So they’re trying to push the bill through with a process called “reconciliation.” Never heard of reconciliation? You're not alone! We’ve created an explainer on this process so your group can read up on why this tricky bit of congressional procedure is so important: Legislative Process 101—Budget Reconciliation. Today and tomorrow are the remainder of the Senate’s mini-recess this month. If your group has plans, make sure you’ve registered them on our website to maximize the number of people showing up and refresh yourself with our Town Hall Tips. Nothing going on near you this mini-recess? Start getting your group ready for the long House and Senate recess April 8–23, and stay tuned: we’ll be rolling out a fresh collection of recess materials soon! Keep sending us your feedback on our new resources and what else would be useful for your group—email field@indivisibleguide.com with your suggestions. Your work is making a difference every week, and every week we’re proud to stand indivisible with you. Together we will win. P.S. We want to amplify your group’s voice! 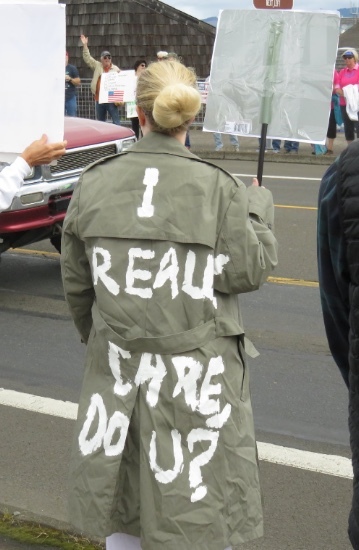 Keep sharing your pictures, videos, and stories with us at stories@indivisibleguide.com, use #indivisible and tag @IndivisibleTeam on Twitter, or post them to Facebook.com/IndivisibleGuide. 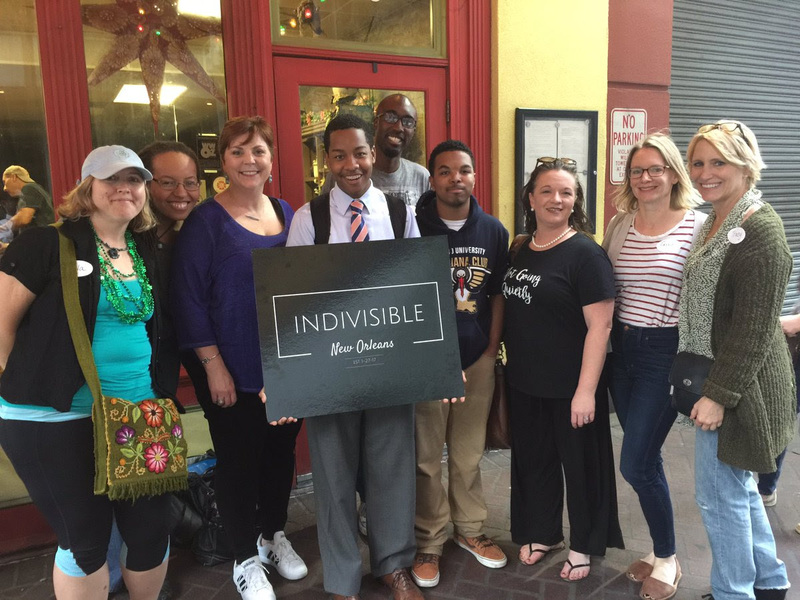 Here’s @indivisibleNO asserting their constituent power in New Orleans last week!